Suchitra Sen (Bengali pronunciation: [ʃuːtʃiːraː ʃeːn] listen (help·info)) (born as Roma Dasgupta) ( listen (help·info); 6 April 1931 – 17 January 2014) was an Indian film actress who worked in Bengali and Hindi cinema. The movies in which she was paired opposite Uttam Kumar became classics in the history of Bengali cinema. Sen was the first Indian actress to receive an award at an international film festival when, at the 1963 Moscow International Film Festival, she won the Silver Prize for Best Actress for playing a disillusioned alcoholic in Saptapadi. In 1972, she was awarded the Padma Shri, the fourth highest civilian award in India. From 1979 on, she retreated from public life and shunned all forms of public contact; for this she is often compared to Greta Garbo. In 2005, she refused the Dadasaheb Phalke Award, the highest cinematic award in India, to stay out of the public eye. In 2012, she was conferred the West Bengal Government's highest honour: Banga Bibhushan. Her first official release was Sukumar Dasgupta's Saat Number Kayedi (1953). She was catapulted to stardom after she was cast as Vishnupriya by Devaki Kumar Bose in his Bhagaban Shree Krishna Chaitanya (1953). Suchitra Sen was born in a Baidya family of Sen Bhanga Bari village of Belkuchi Upazila, now in Sirajgonj District, Greater Pabna in the present day Sirajgonj District of Bangladesh, on 6 April 1931. Her father, the late Karunamoy Dasgupta was a sanitation officer in Pabna Paurasava. Her mother, the late Indira Devi was a homemaker. She was their fifth child and third daughter. Sen is a granddaughter of the famous Poet Sree Rajonikant Sen. She received her formal education in Pabna Government Girls High School. The Partition brought her family and her to West Bengal, where she married Dibanath Sen, son of wealthy industrialist Adinath Sen, in 1947, and had one daughter, Moon Moon Sen, who is a former actress. Her father-in-law, Adinath Sen, was supportive of her acting career in films after her marriage. Her industrialist husband invested greatly in her career initially and supported her. Sen had made a successful entry into Bengali films in 1952, and then a less successful transition into the Hindi movie industry. According to persistent but unconfirmed reports in the Bengali press, her marriage was strained by her success in the film industry. Suchitra Sen made her debut in films with Shesh Kothaay in 1952, but it was never released. The following year saw her act opposite Uttam Kumar in Sharey Chuattor, a film by Nirmal Dey. It was a box-office hit and is remembered for launching Uttam-Suchitra as a leading pair. They went on to become the icons for Bengali dramas for more than 20 years, becoming almost a genre unto themselves. She has acted in 30 of her 60 films with Uttam Kumar. She received a Best Actress Award nomination for the film Devdas (1955), which was her first Hindi movie. Her Bengali melodramas and romances, especially with Uttam Kumar, made her the most famous Bengali actress ever. One of her best known performances was in Deep Jwele Jaai (1959). She played in a character named Radha Mitra, a hospital nurse employed by a progressive psychiatrist, Pahadi Sanyal, who is expected to develop a personal relationship with male patients as part of their therapy. Sanyal diagnoses the hero, Basanta Choudhury, as having an unresolved Oedipal dilemma. He orders Radha to play the role though she is hesitant as in a similar case she had fallen in love with the patient. She finally agrees and bears up to Choudhury's violence, impersonates his mother, sings his poetic compositions and in the process falls in love again. In the end, even as she brings about his cure, she suffers a nervous breakdown. The film is noted for its partly lit close-ups of Sen, which set the tone of the film. Asit Sen remade the film in Hindi as Khamoshi (1969), with Waheeda Rehman in the Suchitra Sen role. A film critic[who?] summed up Suchitra Sen's career and continuing legacy as "one half of one of Indian cinema's most popular and abiding screen pairs, Suchitra Sen redefined stardom in a way that few actors have done, combining understated sensuality, feminine charm and emotive force and a no-nonsense gravitas to carve out a persona that has never been matched, let alone surpassed in Indian cinema"
Smritituku Thak a tribute to Sen at the Kolkata Book Fair in 2014. 29 Jan 2014. Suchitra Sen refused Satyajit Ray's offer due to a scheduling problem. As a result, Ray never made the film Devi Chaudhurani, based on the novel written by Rishi Bankim Chandra Chattopadhya. She also refused Raj Kapoor's offer for a film under the RK banner. Sen continued to act after her husband's death in 1970, but called it a day when Pronoy Pasha flopped, and retired from the screen in 1978 after a career of over 25 years to a life of quiet seclusion. She was to do a film project; Nati Binodini, also starring Rajesh Khanna, but the film was shelved mid-way after shooting when she decided to quit acting. She assiduously avoided the public gaze after her retirement and devoted her time to the Ramakrishna Mission. Suchitra Sen remembrance at Rabindra Sadan, Kolkata. 19 Jan 2014. Suchitra Sen was admitted to the hospital on 24 December 2013 and was diagnosed with a lung infection. She was reported to have been recovering well in the first week of January. She died at 8.25 am on 17 January 2014, due to a heart attack. She was 82 years old. Suchitra Sen's death was condoled by many leaders, including the President of India Dr. Pranab Mukherjee, the Prime Minister Dr. Manmohan Singh, the Prime Minister of Bangladesh, Sheikh Hasina, and BJP's Prime Ministerial candidate Narendra Modi. A gun salute was given before her cremation, upon the orders of Mamata Banerjee, the Chief Minister of West Bengal. Respecting her fierce desire for complete privacy, her last rites were performed at Kolkata's Kaioratola crematorium, barely five and half hours after she died, with her coffin reaching the crematorium in a flower-decked hearse with dark-tinted windows. Despite being Bengal's greatest star, referred to as "Mahanayika", she had consciously chosen to step into oblivion and she remained an enigma till her last, although thousands of fans had converged at the crematorium to catch one last glimpse of their idol. Her entire medical treatment had also been done in seclusion and secrecy. From 1953 to 1978, both in Bengali and Hindi, Suchitra Sen acted in 61 films. Among them, 22 were blockbusters, 13 were superhits, 5 made profits above the average and the rest flopped. 1 1952 Shesh Kothay Unreleased The film didn't release. 2 1953 Saat Number Kayedi 7 Feb 1953 Sukumar Dasgupta Samar Roy This was her first officially released film. 4 1953 Bhagaban Srikrishna Chaitanya 11 Dec 1953 Bishnupriya Debaki Bose Basanta Chaudhury First hit of legendary "Basanta-Suchitra" pair. 12 1954 Agnipariksha 3 Sep 1954 Taposhi Agradoot Uttam Kumar Suchitra-Uttam starring first Box Office Superhit Movie. 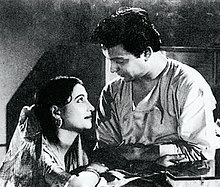 That was the beginning of their Bengali film iconic image of "Sonar-Juti"
16 1955 Devdas Parvati (Paro) Bimal Roy Dilip Kumar Her First Hindi language film Based on Sarat Chandra Chattopadhyay's famous novel "Devdas"
18 1955 Shapmochan 27 May 1955 Madhuri Shudhir Mukherjee Uttam Kumar Suchitra-Uttam starring Second Box Office Superhit Movie based on Phalguni Mukhopadhyay's famous novel " Sandhya Raag". 21 1955 Sabar Uparey 1 Dec 1955 Rita Agradoot Uttam Kumar Based on Scottish Writer A. J. Cronin's 1950 novel, "Beyond This Place"
29 1957 Chandranath 15 Nov 1957 Saraju Kartik Chattopadhyay Uttam Kumar Based on Sarat Chandra Chattopadhyay's famous novel "Chandranath". 30 1957 Pathe Holo Deri 5 Dec 1957 Mallika Banerjee Agradoot Uttam Kumar A navel by then famous write Ms. Prativa Basu. 34 1958 Rajlakshmi O Srikanta 28 Feb 1958 Rajlakshmi Haridas Bhattacharya Uttam Kumar Based on Sarat Chandra Chattopadhyay's famous novel "Rajlakshmi O Shrikanta"
35 1958 Suryatoran 21 Nov 1958 Anita Chatterjee Agradoot Uttam Kumar Based on Warner Brothers one of the famous Hollywood Movies (1949) "The Fountain Head" written by then famous Russian-American writer Ayn Rand. Starring Garry Cooper, Patricia Neal, Raymond Messy, Kent Smith, the film was Directed by Mr. King Vidor. 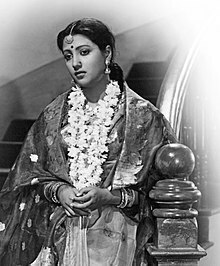 In the Bengali film "Suryatoran", Suchitra Sen did the role of "Dominique" the main female character which was portrayed by Ms. Patricia Neal in "The Fountainhead". 37 1959 Deep Jwele Jaai 1 May 1959 Radha Mitra Ashit Sen Basanta Chaudhury Block-buster movie. 38 1959 Chaowa Paowa 27 Feb 1959 Manju Yatrik Uttam Kumar The Story was taken from Samual Hopkins Adams's short story and a 1934 Oscar-winning Hollywood movie "It Happened One Night", starring Clark Gable and Claudette Colbert, directed by Frank Capra. 44 1962 Bipasha 26 Jan 1962 Bipasha Agradoot Uttam Kumar This was the first film where Suchitra Sen charged Rs. one lakh for doing her role., and this was the first time any Bengali actor (male or Female) received Rs. One Lakh for doing any film acting role. It was a milestone for Bengali movie history. 46 1963 Uttar Falguni 11 Oct 1963 Debjani / Pannabai / Suparna Ashit Sen Dilip Mukherjee, Bikash Roy Based on well known Bengali Writer Dr. Nihar Ranjan Gupta's Novel "Uttar Falguni". However, this story was originally taken from a 1936 Bengali Film "RIKTA" starring Rani Bala and Shushil Majumdar. 48 1966 Mamta Devyani / Pannabai / Suparna Asit Sen Dharmendra, Ashok Kumar Hindi version of Bengali film "Uttar Phalguni"
49 1967 Grihadaha 5 May 1967 Achala Subodh Mitra Uttam Kumar Based on Sarat Chandra Chattopadhyay's famous novel "Grihadaha"
50 1969 Kamallata 2 Oct 1969 Kamallata Haridas Bhattacharya Uttam Kumar Based on Sarat Chandra Chattopadhyay's famous novel "Kamallata"
She is the first Indian actress to receive an international award. ^ Sharma, Vijay Kaushik, Bela Rani (1998). Women's rights and world development. New Delhi: Sarup & Sons. p. 368. ISBN 8176250155. ^ "Suchitra Sen, Bengal's sweetheart". NDTV. 17 January 2014. Retrieved 17 January 2014. ^ Bannerjee, Monideepa (17 January 2014). "Why Suchitra Sen became a recluse and other stories". NDTV. Retrieved 17 January 2014. ^ "Suchitra Sen awarded Banga-Bibhusan". Zee News India. 20 May 2012. Retrieved 2 June 2012. ^ Das, Mohua (20 May 2012). "The perils of a packed prize podium Ravi Shankar declines award". Telegraph, Kolkata. Calcutta, India. Retrieved 2 June 2012. ^ "Bhagwan Shri Krishna Chaitanya (1953) - Review, Star Cast, News, Photos". Cinestaan. Retrieved 2019-03-15. ^ a b Deb, Alok Kumar. "APRIL BORN a few PERSONALITIES". www.tripurainfo.com. Archived from the original on 10 December 2008. Retrieved 23 October 2008. ^ "Garbo meets Sen Two women bound by beauty and mystery". Telegraph. Calcutta, India. 8 July 2008. Retrieved 2 June 2012. ^ Suhrid Sankar Chattopadhyay (7 February 2014). "Suchitra Sen : Reclusive legend". Frontline. Retrieved 30 January 2014. ^ Chakraborty, Ajanta (18 Jun 2011). "Actress Suchitra Sen's secrets out!". TNN (Times of India). ^ Deepanjana Pal. "RIP Suchitra Sen. It is the end of a fairytale". Firstpost. Retrieved 20 January 2014. ^ "Bengali cinema's golden queen Suchitra Sen no more : Movies, News – India Today". Indiatoday.intoday.in. Retrieved 20 January 2014. ^ Pal, Deepanjana (17 January 2014). "RIP Suchitra Sen. It is the end of a fairytale". Firstpost. Retrieved 17 January 2014. ^ Nag, Amitava (17 January 2014). "Uttam Kumar and 'Mrs Sen': The magical, hypnotic Uttam-Suchitra years". Retrieved 17 January 2014. ^ Dasgupta, Piyashree (17 January 2014). "Why Suchitra Sen is a part of every Bengali's favourite memories". Firstpost. Retrieved 17 January 2014. ^ "The Best Films of Suchitra Sen". Rediff. 17 January 2014. Retrieved 17 January 2014. ^ Gupta, Subhra (17 January 2014). "Suchitra Sen: A superstar in Bengal, an accidental tourist in Mumbai". Indian Express. Retrieved 17 January 2014. ^ Verma, Sukanya (2 December 2013). "Waheeda Rehman's haunting melancholy in Khamoshi". Retrieved 17 January 2014. ^ "Waheeda Rehman's haunting melancholy in Khamoshi". Rediff. 21 November 2013. Retrieved 17 January 2014. ^ Ray, Gitanjali (17 January 2014). "Suchitra Sen, Bengal's sweetheart". NDTV. Retrieved 17 January 2014. ^ "Bengali cinema's golden queen Suchitra Sen no more". India Today. 17 January 2014. Retrieved 17 January 2014. ^ Jamil, Maqsud (17 January 2014). "Endearments of boundless charm". Daily Star. Retrieved 17 January 2014. ^ Sur, Prateek (17 January 2014). "10 less known facts about Suchitra Sen, the first Paro of Bollywood". Retrieved 17 January 2014. ^ Chatterjee, Saibal (17 January 2014). "Suchitra Sen: Iconic Indian Bengali actress dies". BBC. Retrieved 17 January 2014. ^ IANS (6 April 1931). "Suchitra Sen: The quintessential enigma despite 59 films – Times Of India". Timesofindia.indiatimes.com. Archived from the original on 18 January 2014. Retrieved 20 January 2014. ^ "'Uttam wanted to meet Suchitra Sen a week before his death' – Times of India". Timesofindia.indiatimes.com. 28 September 2012. Retrieved 20 January 2014. ^ "Veteran actor Suchitra Sen's health improves". The Hindu. 4 January 2014. Retrieved 17 January 2014. ^ "Veteran actress Suchitra Sen dies in Kolkata hospital after massive heart attack". Financial Express. 12 June 2012. Retrieved 17 January 2014. ^ "Suchitra Sen suffers massive heart attack, passes away – Entertainment – DNA". Dnaindia.com. 22 October 2013. Retrieved 17 January 2014. ^ "Indian Leaders Condole the Sad Demise of Suchitra Sen". Biharprabha News. Retrieved 17 January 2014. ^ "BBC News – Suchitra Sen: Iconic Indian Bengali actress dies". Bbc.co.uk. Retrieved 17 January 2014. ^ "Rahe na rahe hum...Legendary Actress Suchitra Sen Bids Adieu". Learning and Creativity. 17 January 2014. Retrieved 22 January 2014. Wikimedia Commons has media related to Suchitra Sen.